You will find photos of our actions on our flickr account. You are welcome to report about our action, in the days before or right from site of action. We are happy to give interviews. It’s also possible to accompany activists into the action. 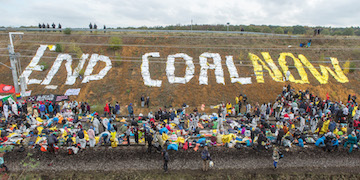 Press Release November 5th, 2017, 4:00 p.m.
Press Release November 5th, 2017, 11:11 a.m.
„Ende Gelände“ sets out for mass action of civil disobedience + Activists call for climate justice and exit from fossil fuels Buir.